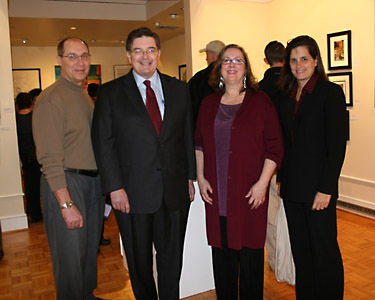 MCCC Gallery Announces Winners of "Mercer County Artists 2011"
West Windsor, N.J. - The Gallery at Mercer County Community College announced the award winners for "Mercer County Artists 2011" at an Opening Reception Mar. 9. The exhibit, which runs through April 7, features 120 works by 95 artists who live, work or study in Mercer County. 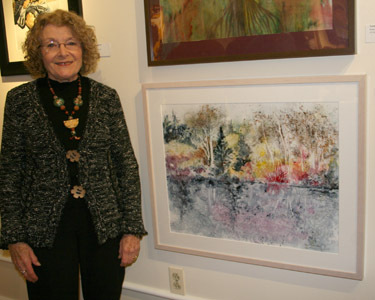 The pieces were selected from 240 entries by this year's juror, Janet Hunt, the owner and director of Coryell Gallery, located in Lambertville. 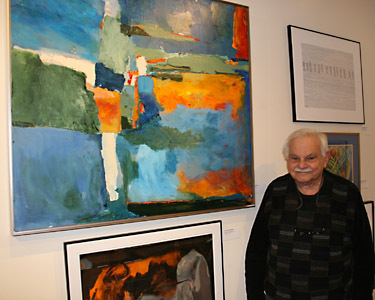 Hunt has been a key figure in the arts community of central New Jersey for decades. According to Gallery Curator/Director Tricia Fagan, the exhibit features approximately 80 two-dimensional works and 40 three-dimensional works. Most art media are represented, including oils, watercolors, charcoal, ceramics, wood, handmade paper, acrylics and mixed media. One-quarter of the artists selected are newcomers. This annual exhibit is a collaboration between the college and the Mercer County Cultural and Heritage Commission. The Gallery is located on the second floor of the Communications Building on Mercer's West Windsor campus at 1200 Old Trenton Road. Addressing the artists at the awards ceremony, Fagan extolled them for their beautiful art. "Without all of you, our lives would be much less colorful." Mercer County Freeholder Andrew Koontz, who holds a degree in Fine Arts from New York University, added his words of appreciation. "I know how much hard work and how many hours this represents. On behalf of the county, we thank you for providing this educational opportunity for students at the college." Winner of the Utrecht Art Supplies Best in Show Award was Al Aronson, of Princeton, for his acrylic abstract, "Planar." Aronson received a generous gift certificate from Utrecht Art Supplies, located in Cranbury. An MCCC alumnus, Aronson pursued his associate degree in Fine Arts in the 1970s, while working days as an aerospace engineer. Now retired from his career in engineering, he is pursuing his art with a passion. The two Juror's Choice Awards went to Harold Popowitz, of East Windsor, for "Presence," an acrylic on masonite, and Larry Chestnut, of Hamilton, for his oil painting, "Autumn Transition #2." Chestnut, a former graphic designer, now paints full time. "It's what I want to do," he said, noting that painting requires physical stamina and he is doing it "while the sun is still shining." Honorable Mentions were awarded to six artists including: Mic Boekelmann, of Princeton, for her charcoal drawing, "Inner Strength"; Dee Gozonsky, of West Windsor, for her watercolor, "River Bank"; Charles McCollough, of Hopewell, for his elm wood sculptures, "Grounded Pig" and "Flying Horse"; Maxine Shore, of East Windsor, for "Central Park Shade"; Mary Waltham, of Princeton, for her oil painting, "Haymaking"; and Susan Winter, of Hightstown, for her oil painting, "On the Wall." Winners of Purchase Prizes, selected by representatives from the Mercer County Cultural and Heritage Commission, are Larry Chestnut for "Autumn Transition #2" (his second prize); Bill Plank, of Lawrenceville, for his watercolor, "Exiles"; and Susan Winter for "On the Wall (her second prize). Winners of awards from the West Windsor Arts Council included Katarzyna Iwaniec for her oil painting, "Pink Table," and Ronald W. LeMahieu for his raku-fired ceramic, "Trio," and mosaic "Skull/Black & White." The artists selected for the show turned out in droves, both to celebrate their own participation and to view the works of other artists in the local community. Award winner Mary Waltham noted that artists work in isolation. "To be selected is an affirmation of what we're doing. You need that occasionally. And it's great to come out and see what other artists are doing." Originally from the United Kingdom, Waltham said she was given a choice in high school to study either art or science. She chose science then, but has been fully devoted to art for the past five years. Mostly self-taught, she is delighted and inspired to be part of the exhibit. 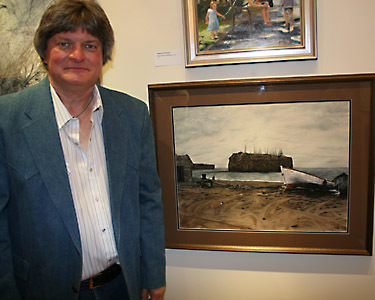 Award winner Dee Gozonsky, a retired art teacher, was also thrilled with the exhibit. "The work is exemplary and outstandingly diverse. This show was wonderfully juried," she said. For a complete list of artists featured in the show, click here. Now in its 39th year, the Mercer County Artists show continues to feature some of the region's most talented artists. 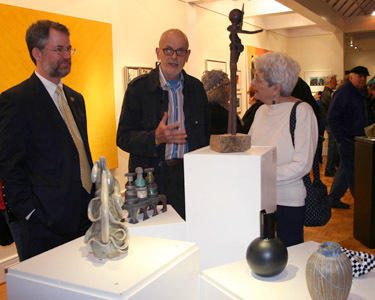 Works in all media except for photography (which is featured in a separate county show) are exhibited by both well-established and emerging artists. This exhibit is supported, in part, by the Mercer County Cultural & Heritage Commission, through a grant from the Mercer County Board of Freeholders and the New Jersey State Council on the Arts/Department of State. Gallery hours for the show are: Mondays, 6 to 8 p.m.; Tuesdays, 11a.m. to 5:30 p.m.; Wednesdays, 9 a.m. to 3 p.m. and 4 to 8 p.m.; and Thursdays, 9 a.m. to 5:30 p.m. For more information, call (609) 570-3589 or visit the Gallery website. Among the attendees at the Awards Reception were, from left, artist Larry Chestnut, Mercer County Executive Brian Hughes, Gallery Director Tricia Fagan, and County Director of the Office of Economic Development and Sustainability Liz Maher Muoio. Al Aronson was the Utrecht Best in Show winner for "Planar." 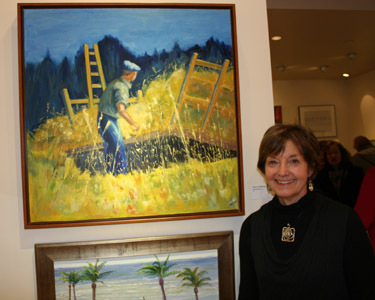 Mary Waltham earned Honorable Mention for "Haymaking," inspired by a trip to the French Alps. 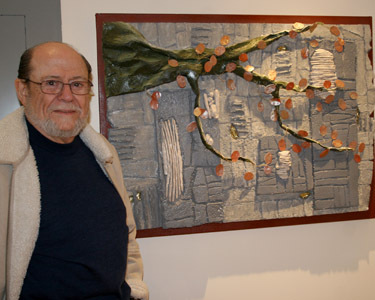 Retired art teacher Dee Gozonsky earned Honorable Mention for "River Bank." 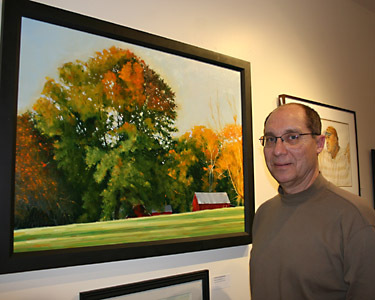 Larry Chestnut won two awards for "Autumn Transition #2." Bill Plank's watercolor, "Exiles," won a Purchase Award. 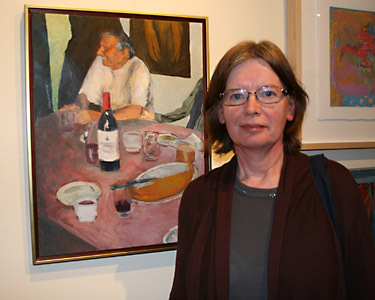 Katarzyna Iwaniec won a West Windsor Arts Council Award for "Pink Table." Barry Altman, M.D., with his frieze/relief, "Jaffa Wall."